Kiana was honored to be the Silver Sponsor at this year’s HPE Aruba event which was held Sept 19-21 at the Parisian Macau, in Cotai, Macau, China. The event hosted over 1,800 delegates from 20 countries, including China, Korea, Japan, Singapore, India, Malaysia, & Australia. Kiana was highlighted in the Smart City/Safe City Innovation Zone, which featured companies and technologies that are creating a smart, safe city with video analytics, IoT and predictive maintenance. 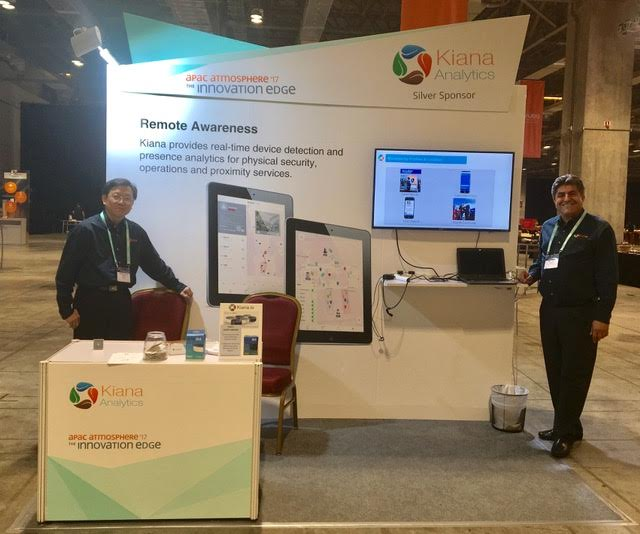 Kiana’s key differentiators on demonstration at the event included remote device detection accuracy combined with camera/video surveillance data, Social WiFi services, and other data sources to deliver on the promise of Smart City/Safe City. Kiana continues to see considerable interest from shopping malls, transportation hubs, museums, amusement parks and other large venues.